Steinsdalsfossen is one of Norway's most visited waterfalls. On a good walking path, you can go behind the waterfall and enjoy nature's powers. At Gullfiskvatnet, located 5 km from Øystese, you can feed goldfish from land. In addition to nature attractions, Kvam has several museums such as Hardanger Fartøyvernsenter or Ingebrigt Vik Museum / Kabuso Art House. Activities from fjord to mountains such as hiking on marked trails or swimming in fjord and mountain water awaits you in Kvam. The beautiful Hardangerfjord and the magical Fyksesund can be experienced on a fjord “cruise”, by canoe or kayak. By car and map, you can travel on exploring in and around Kvam. Be inspired by our tour and activity suggestions under "Activities". Fyksesund Landskapspark lies approximately 10km east of Øystese. A great area adapted for nature and cultural experiences. 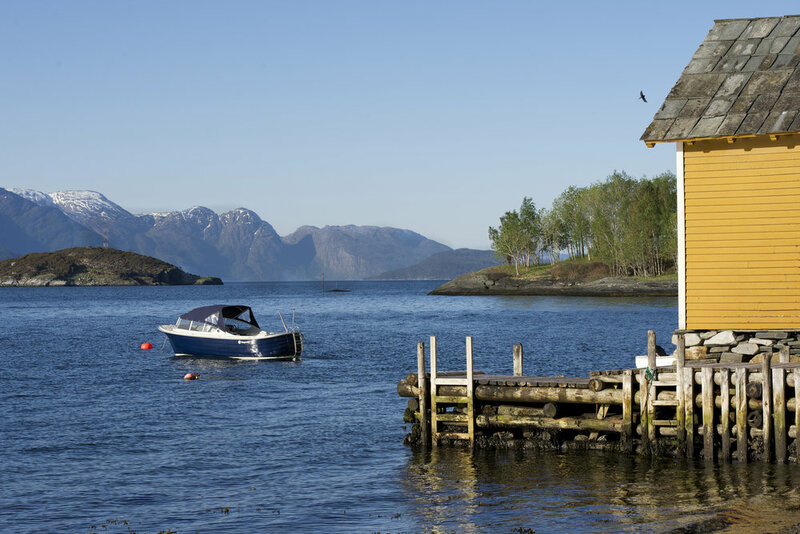 Marked hiking trails and free trail map, local accommodations and café with local flavors and at the pier at Steinstø you will find the open to public Hardanger Aquarium. The area has possibilities for great nature experiences in the summer season. Canoeing and kayaking, guided boat and mountain walks with more. One of Norway's most visited waterfalls lies just off Fv.7, 2 km from Norheimsund towards Bergen. The Steinsdalsfossen has a fall of 50m and is special because you can walk behind the fall without getting wet. There is a walking path from the parking lot and up under the waterfall, a short little walk. The Steinsdalsfossen is at its largest and finest in May - June during the snow melting. Boat, kayak guided tours for rent. French way that makes an original distinctive color scheme on the ceramic. The river jetties in Fitjadalen are located along the trail called Sogestien and are easily accessible. One can drive up to Fitjadalen / Fete where there is parking. Municipal public bathing areas are located at the beach in Norheimsund, and Øystese. Other public swimming areas with facilities can be found along the fjord on the stretch along the fjord between Strandebarm to Ålvik: Ljonestangen (Ljones), Eidesvågen (Tørvikbygd), by the boat harbor in Vikøy, Holmsund (Skipadalen), Laupsa (Øystese) and Tyrvefjøra in Ålvik. In Kvam there are also many mountain water you can swim in, to the dam's Krokavatn, Skårsvatnet and Fitjadalsvatnet. Start your cycling adventure in Hardanger with a bike rental in Øystese. The experience starts with good equipment and good bike area suggestions. We offer both! Rental also available at the tourist information office.